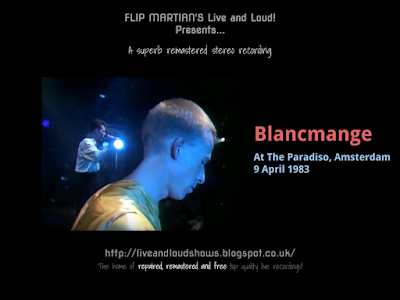 I originally intended to remaster a recording from the Manchester Hacienda from 1982 - not realising it was on general DVD release (I assume officially). Which is a shame as I had it sounding really good! Instead I found this one - an interesting (but sadly short) FM broadcast from Dutch radio of a live set by Blancmange from 1983. There are some faults with this - essentially some FM static on the first song in various places (I've removed or lessened what I could) and the last track broadcast, Blind Vision, has had to be faded out rather abruptly by the original taper to remove the radio lead in to the news. But its a little gem, nonetheless, featuring tracks from Happy Families and also Mange Tout which was released a year later. Apart from working on the static noise and a few clicks, I used EQ to tighten up a rather bass heavy recording and give some space to the instruments and vocals. Lasting just over half an hour, the show is available for download HERE as 1 MP3 file. Or, if you would like to have separate tagged MP3s, or even lossless files in FLAC format, head on over to the Donations tab to see how you can obtain these for a very small donation towards the site costs.